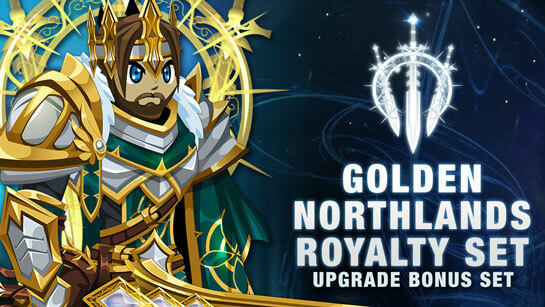 Upgrade to unlock the exclusive Golden Northlands Royalty set! Rule the frozen Northlands as a King or Queen! Buy any AC or membership package worth $10 USD or more to unlock one of our upgrade bonus packs, then log in to your Account Manager and choose the Golden Northlands Royalty set. Once you've chosen the Golden Northlands Royalty set on the Account Manager page, log in and find the set's shop in the Other Achievements tab in your Book of Lore. Permanently unlock the color-customizable Titanium Northlands Royalty set when you buy the Titanium Trove for 6,000 ACs. Buy any membership or AdventureCoin pack worth $10 USD or more. Choose the Golden Northlands Royalty upgrade bonus in your Account Manager. Log in at www.AQ.com and find your Golden Northlands Royalty badge shop. Buy the Titanium Trove item. /join battleontown and head to Vinara's Curio Shop. Click on the Golden Northlands Royalty to unlock your gear. 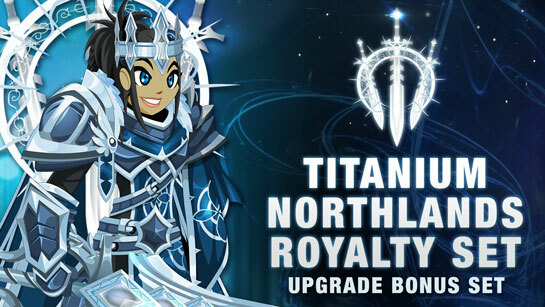 *During December 2018, the Titanium Northlands Royalty set was available for players who purchased a 12,000 AC pack or 12 month membership. The Titanium Trove is priced to keep the total cost of the Titanium Northlands Royalty set equivalent under our new system. This set will not be purchasable as a separate upgrade bonus. Our Upgrade Bonuses Level Up... Choose your Reward! In the past, our upgrade bonus sets would only be available for a single month, and then would become permanently rare. We made some really incredible gear... that no one can get now. I've talked with many of you individually to brainstorm and get feedback, and starting this month, our upgrade bonuses will become permanently available. We will continue to add new upgrade bonuses regularly, but the big difference is... now you can choose which upgrade bonus set you want! Upgrade Pack Changes: Why Now? As I talked with many of your fellow AQW players about these changes, one question repeated itself over and over: "why do we need to do this? Why now?" Development for AQW:Mobile is going to go into overdrive. With AQW:Mobile, we will not be able to do nearly as many rare items (this is in large part for game performance reasons, like managing asset loading, just like in AQ3D). It is also a pretty big blow to the artists and future players to lose access to entire sets of gear every month. We want to avoid that. We want to keep all the incredible art the team makes available for everyone, no matter when they start playing. And as we move into new platforms (mobile devices, Steam, ... maybe consoles?!) we want to make sure that art is available for the new heroes who will join you.